I first caught wind of Amy’s quilty confessional on 13 Spools via Molli Sparkles. The linky party is well worth clicking out. It’s fun to see civil diversity of opinion. Of course I was inspired to create my own list. And, it was surprisingly hard to keep it to eleven items. I get a thrill out of perfectly matched seams and pointy points. I unapologetically work hard to get them. And, I will unsew to fix a mismatch. I hate to unsew. That being said, I love my Clover seam ripper. I really don’t get the Great De-Stash thing on IG. I mean, really, $20 per yard? Did I miss a memo about fabric production coming to an end? I pre-wash my fabric. And, I let it get all stringy in the wash. I iron my fabric after washing it and press while piecing. I have many, many UFOs. And, a list of them. I hide the list. The phrase “quilt as desired” strikes fear in my heart. I hate making quilt backs. I love hand stitched bindings. And, I sew the corner miters closed. I pin match seams. A new package of Clover fine flower head pins is a gift I give myself every new year. I started my blog as a way to learn to work on my Guild’s blog. I spend way more time on the Guild blog than I do on my own (as evidenced by the whopping two posts in 7+ months). Oh yes 3-5, even though I just gave Emily $20 for 3 lbs of solid scraps via IG – I just needed to immediately buy fabric And yay for personal blogging, I think my last entry was in February. 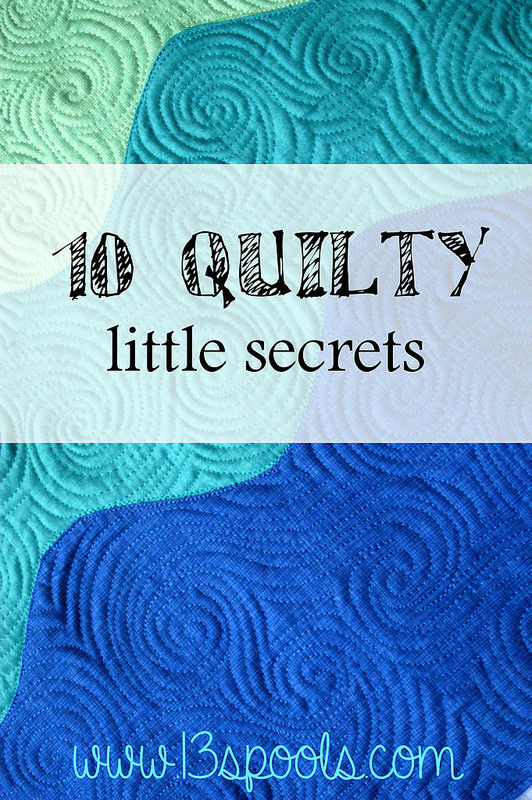 Loved your 10 Quilty Secrets, most of which I totally relate to!!! I also love your posts so please, please write more!!!! I have to come look around your blog now. On the prewash, me too, because of chemicals shrinkage and bleeding. It’s important to do and I think all the bragging about not washing is nuts. Cut the tips off the yardage at an angle and no more strings in the wash. I too prewash all my fabrics and read years ago how to avoid strings.If You snip off the corners of each side of your material it won’t fray and the added bonus for me is that I always know which pieces of my stash are washed and which are not.